At Beanstalk we guide you to an appropriate risk profile based on your age, reason for saving, product choice and term (the length of time you expect to be saving for). We have classified all available funds on this website as either Aggressive (meaning it carries more risk but offers higher potential returns), Moderate (where we believe the fund strikes a balance between risk and security) and Conservative (meaning the risks are likely to be lower with that fund, but so are the possible returns). Beanstalk's aggressive risk fund selection is best defined as funds we believe might offer you the best possible return on your money. These funds are however more volatile which means that they have a greater risk associated with them. These figures reflect what R100,000 invested 10 years ago could have been worth today. Beanstalk's moderate risk fund selection is best defined as those funds having a balance between the risk of losing money and the average long term gain that the fund has yielded. Beanstalk's conservative risk selection includes those funds we believe are the safest to invest in relative to the moderate and aggressive fund selections. They will generally offer a better return than cash, but this will be lower than the returns that you may earn if you select either a moderate or aggressive fund. On the other hand, these funds are pretty safe and you shouldn't suffer major losses if you invest in them. These figures reflect what 100,000 of the fund's currency invested 10 years ago could have been worth today in the same currency. This does not consider exchange rate fluctuations which may have positively or negatively influenced the returns of these funds. The average annual return figures shown on this page are based on available data from the past 10 years for each of the funds offered by Beanstalk, and reflect the average return you could have earned during that period if you were invested in that fund continuously in each year. There is a lot of confusing terminology in the finance industry, and a lot of measurements and equations are used to determine and illustrate risk and return. We can't completely avoid some of this terminology but we will do our best to demystify it, and one of the key terms we would like to familiarise you with is called Maximum Drawdown. Many funds suffered their worst losses in the market crash of 2008, and saw prolonged periods (up to 23 months) during which time they lost money. 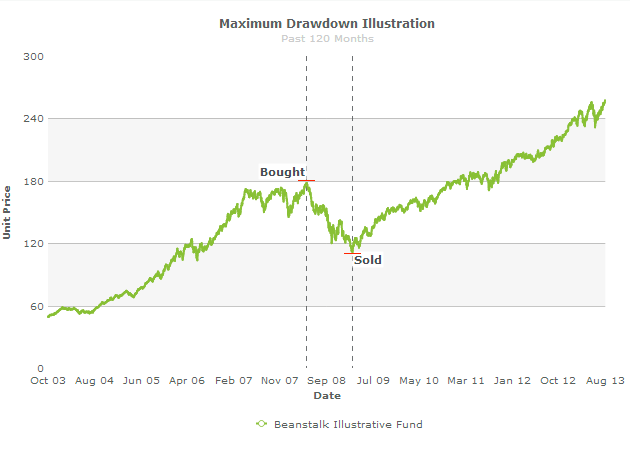 Maximum Drawdown represents the maximum percentage of one's investment that could be lost if a person bought a unit trust at the highest point of the biggest losing period for that fund, and sold it at the lowest value over the same period. It is easy to identify the maximum drawdown when looking at a graph, so hopefully the illustration below will help you get to grips with this concept. This graph shows the unit price for a unit trust over a 10 year period, and we have highlighted the maximum drawdown months when the fund lost the most amount of money, continuously. If you bought at the point marked "Bought" and sold at the point marked "Sold", you would have experienced the biggest loss possible over the entire 10 year period. IMPORTANT NOTE even if you had bought at that worst possible time, your investment could have still been worth more than you started out with had you continued to hold onto the unit trust and not sold it at the bottom of the graph as shown. How do we categorise funds into risk profiles? We have done all the homework for you and selected top performing unit trusts for different savings and investment needs. For a more comprehensive breakdown of how we pick funds, please visit our how we work page. In summary, every fund selected for the Beanstalk site has been extensively researched and assigned a risk score based on numerous fund metrics - not just those shown on this page. This risk score determines which risk category the fund gets assigned to. The average return scenario simply reflects what R100,000 invested at the start of the ten year period would be worth today, and is based on the average annual return percentage. The worst scenario figures reflect the value of a R100,000 investment made at the peak of the maximum drawdown period and sold at the bottom of it. In other words, if you happened to have invested over the exact period when the fund lost the most money in the past 10 years, this worst scenario figure is what you would have been left with.